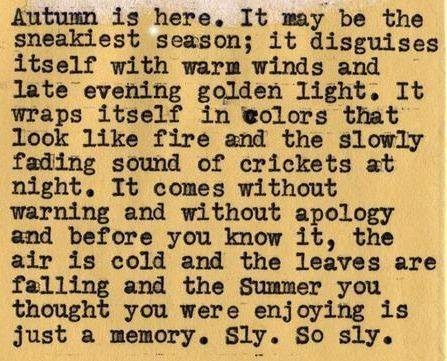 A Lovely Life, Indeed: Happy Fall! And just like that, summer was over. Here's to a fall of wonderful memory making. Cheers! Love that text, did you write it or find it somewhere? I love it, too! I'd love to know where it's from. A friend of mine posted it on her FB page. But when I did a further search, I found that it was part of a poem by Tyler Knott. I have adjusted the link above. I just love the Fall in New England! Hope you have fun stuff planned to enjoy it! This lovely poem is so true, so sly. Hope all is going well with you! And already we had a fun fall evening with wine and chocolate! I love love love that quote. And I am excited about apple cider and wearing cute boots :).